Pet lovers! Today only this PetChatz HD Two-Way Audio/Video Pet Treat Camera is just $299.99 (Reg. $374.99)! Now you can stay connected to your pet from anywhere with the revolutionary PetChatz HD Wifi Two-Way Audio & Video Camera and Treat Dispenser. 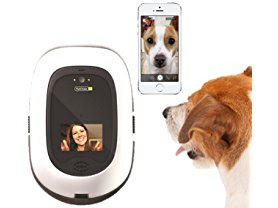 This Greet & Treat® videophone allows you to see, hear, speak to, calm and reward your beloved pet using your smartphone, tablet or computer. Sound and motion-detection sensors alert you to barking, mischief or other unexpected events, while the premium two-way audio and HD low-light camera gives you complete peace of mind knowing he's safe and happy while you're away. And you'll never miss a moment to reward his good behavior with the remotely-activated treat dispenser. If he's feeling stressed, you can even help calm him with a soothing, remotely-activated spritz of PetChatz Scentz calming scent.